When filling out the DS-3053 form you need to use black ink and make sure your writing is legible and all the information is accurate and complete. Illegible applications will cause delays or even suspension of the application processing time. In all cases this form is to be submitted with a DS-11 form. Keep in mind that the DS-3053 is only valid for three months from the date it is notarized and a new form will be needed each time you reapply. If you are the applying parent and you are using this form as statement of special circumstances you will need to fill in section 5a. This is only to be used when the written consent of the non-applying parent or guardian cannot be obtained. The statement must explain in detail the non-applying parent’s unavailability and recent efforts made to contact the non-applying parent. 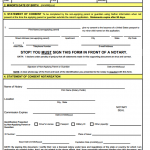 You do not have to have notarized and will submit this form alongside the DS-11 form at the Acceptance Clerk.